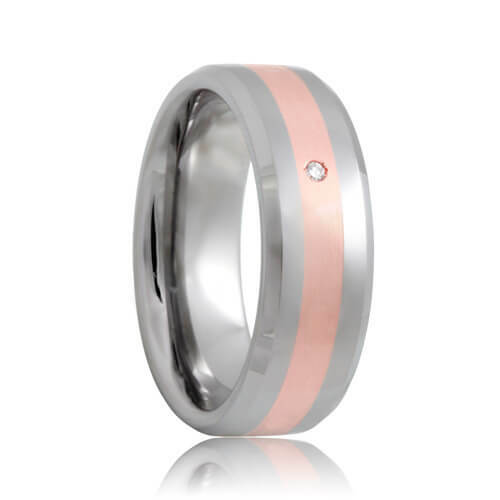 The Rochester tungsten wedding band has a beveled profile and a rich rose gold precious metal inlaid in the center of the ring. The reddish warm color of the rose gold contrasts brilliantly with the cool gun metal grey color of the tungsten carbide. There is a diamond solitaire set in the center of the inlay for added luxury. These tungsten rings feature a comfort fit interior so you can slide these ring on and off your finger with ease. This style is made to order so please allow 5 - 10 business days to manufacture and ship. Free Lifetime Warranty and Lifetime Sizing; pay no restocking fees or deductibles! I went from no knowledge of tungstun carbide to becoming a tungstun wedding bands expert in just a few days with Tungstun Company's education material. I would not buy a tungstun carbide ring from any other store, they will rip you off. This ring is quite stunning. The diamond and the rose gold looks flawless. I actually get people asking me about it all the time. Tungstun Company has the best customer service and when you see the ring, you can tell it's a high quality ring. I tell everyone I know about Tungstun Company. Search around and compare, you will know you can't get a better price with the same warranty in other stores.